The Placer County Water Agency (PCWA) is the primary water resource agency for Placer County, California. Placer County reaches from north of Sacramento to the shore of Lake Tahoe. The county includes the cities of Auburn and Roseville. The PCWA is responsible for water resource planning and management, retail and wholesale supply of irrigation water and drinking water and production of hydroelectric energy in Placer County’s 1,500 square mile area. The hydroelectric power system consists of 2 major reservoirs, 5 plants, 7 dams and 24 miles of tunnel. It produces 1,030,000 megawatt hours. The PCWA needed to protect current and future infrastructure at two of its hydroelectric power plants near Foresthill, California. At the Ralston Hydroelectric project an 8-foot diameter penstock dropped water 1,500 feet to the power generating turbine below. Rockfall from this slope endangered not only the infrastructure, but also posed a danger to the workers maintaining the equipment. The requested barriers were to be European Guideline ETAG 027 compliant and installed adjacent to the penstock. This location prevented the design or installation of lateral bracing and energy absorbing cables on the east end of the barriers. 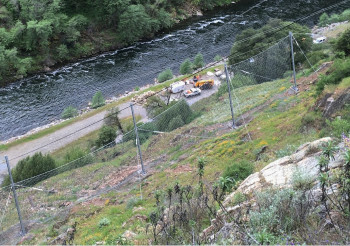 Two 2,000 KJ RMC 200A Barriers were designed and manufactured with special lateral bracing beams to support the cables, ring net, and double twist wire mesh. Because the RMC Barriers require only small leveling pads for the placement of support beams, the construction company Sage Engineers was able to prepare and install the pads. Care was taken to get the angle of the lateral bracing pad, and the helicopter delivery and installation was successfully completed on the first attempt. The project was completed on time and under budget due in part to thoughtful layout and design, meticulous logistics when specking and ordering materials, and constant communication with the design and construction entities during installation. A case history about this project is downloadable at this link. For further information on our Rockfall Protection applications, please feel free to contact us.